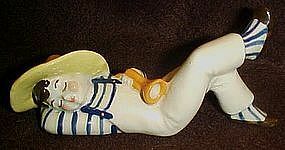 Ceramic Arts Studio, Little Boy Blue figurine, was produced in 1948. He’s 4 1/2" long and sports a striped shirt and socks. There are no chips, cracks or repairs. Where's the little boy who tends the sheep? He's at Sherry's Antiques and fast asleep.